The following charts plot an index of the value of the US dollar in terms of human time. The plots are logarithmic (the natural log of the index for charting purposes), with the index itself referenced to the beginning of 2000. 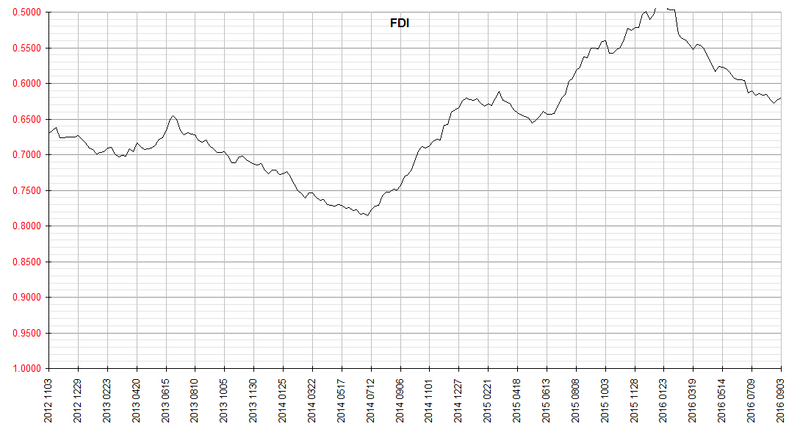 This chart shows the past eight hundred weeks of the FDI. 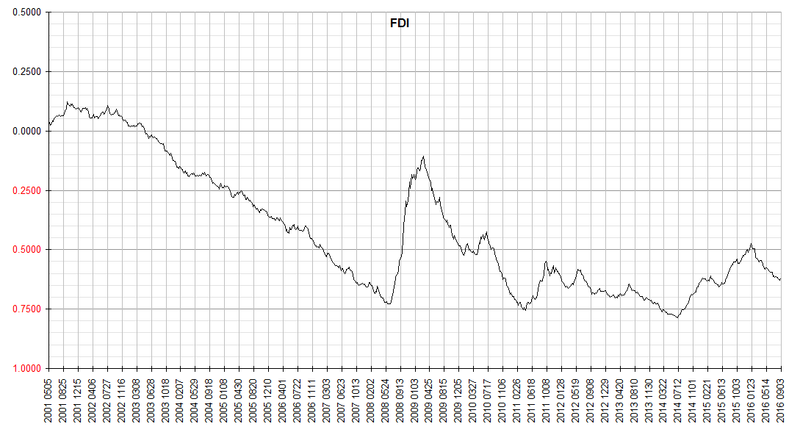 This chart shows the past two hundred weeks of the FDI. 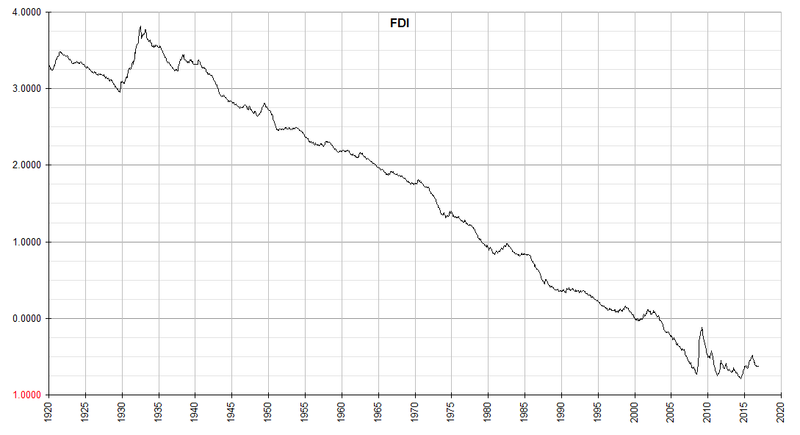 This chart shows the past one hundred years of the FDI. Conventional inflation indices suffer from well-known defects which cause them to tend to understate inflation. For example, the US CPI omits house prices, using instead homeowner?s equivalent rent. This is a severe drawback, because the same low interest rates which can feed inflation also put downward pressure on real estate cap rates, making rents low in comparison to actual prices. The result is that even as the prices of these assets escalate with inflation, the homeowner?s rent substitution cancels that out of the CPI. In addition, the CPI also contains some "quality adjustment hedonics", which are questionable in that they reduce effective price increases for some goods, but do not take into account quality decreases such as those encountered with genetically engineered and irradiated foodstuffs. But the problem goes far deeper than that. The CPI itself was not intended to be an overall measure of inflation. Just as the name suggests, it is no more than an index of consumer prices. And although the US dollar is ubiquitous in global commerce, it only measures domestic prices. Consumer prices embed domestic wage rates as well. Wages are notoriously sticky, in economist?s parlance, especially in the downward direction. Much of wages are determined by contracts negotiated and effective for years. And although notable exceptions can be found, workers, being habituated to inflation, are very reluctant to accept decreases in nominal wages. So if the dollar rises in value, the real value of wages increases. This leaves wages artificially high, and as we know from Econ 101, when prices are artificially high, surpluses develop. In the case of labor surpluses, we merely call them "unemployment". So in fact unemployment can be a temporary manifestation of deflation. With so many prices being slow to adjust, what takes up the slack when the rate of inflation or deflation changes? Any prices that are determined on a real-time basis. These include asset prices such as stocks and bonds, home prices, commodity prices, and currency exchange rates. Corporate profits also increase or decrease in reaction to shorter term changes in the money supply. Market based currency exchange rates are very important. For while US domestic wages very reluctantly adjust to changes in the money supply, the dollar equivalent of foreign wages changes in real time. If for example the dollar increases by 5% versus the euro over a short span of time, it also increases by 5% against European labor. European dollar wages thus can fall precipitously while no such deflationary change is captured in conventional US inflation gauges. Yet the conventional dollar index, which does measure these effects, is also incapable of giving a true measure of inflation or deflation. It merely measures the value of the dollar against other currencies, which themselves may be losing or gaining in real value. This is especially the case over longer periods of time, as virtually all national currencies tend to lose value to inflation. And in the case of competitive devaluation, this effect can be significant even over relatively short time frames. The FDI therefore is designed to be a broad measure of the value of the US dollar somewhat analogous to a reciprocal of the CPI in that it tends to capture long term changes in the value of the dollar against real things, but takes into account the full scope of global commerce. It is analogous to the US Dollar index in that it provides a series explicit in the value of the dollar, but measures it in terms of human time, rather than currencies which themselves fluctuate and decline in value. In calculation of the series, the value of the dollar during a period centered on the beginning of the year 2000 is taken as one. For charting purposes, a log transformation is done in order to proportionately show proportional changes in the value of the dollar.